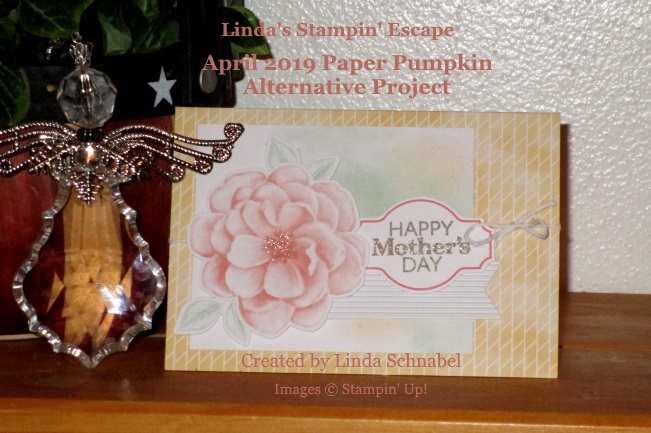 Today I’d like to share with you a Mother’s Day card I created using the items in the April 2019 Paper Pumpkin kit. I love these kits, first, because they come in my mailbox (better than bills – lol), they are easy to use, they introduce us to new products, like this months Destinktive stamps, and because everything coordinates with our current product line so it’s a breeze to make alternative projects from the kits if we choose! 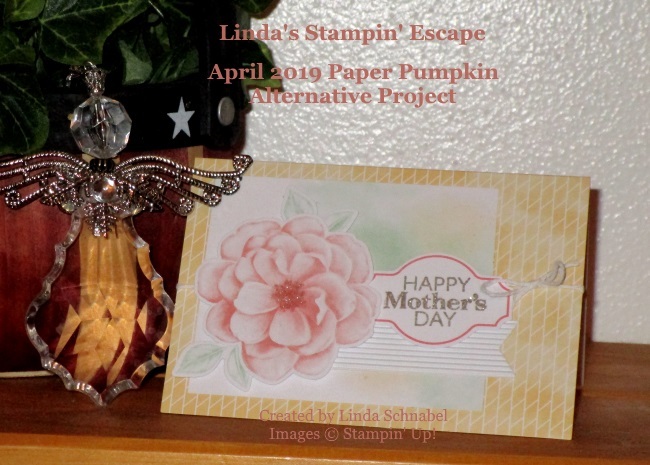 Distinktive stamps are the latest innovation here at Stampin’ Up!, and the Paper Pumpkin team loves them so much that we decided to give you two of these very special stamps in our April kit. Distinktive stamps give you photorealistic-style images in one stamp, and as you can see, the result is stunning. Everything you see on my card was included in the kit except the Wink of Stella. The card base, the colored background, and the rose are all pre-done for you. There is a beautiful rose in the stamp set included in the kit (that is another thing I like about Paper Pumpkin – an exclusive stamp set each month that you can keep using once your consumables in the kit are all gone) I just used the greeting today. So the only stamping I did was my greeting, everything else was ready for me to assemble the card… and a little hint of Stella on the rose and gently over Mother. Someone asked me why the little Angel was in my photo’s … she was a gift I bought my sister Eileen while she was battling her cancer, and Eileen was the wind beneath my wings as my stamping side kick … we did it all together. ❤ Now her and Mom are together along with my other sister Ruthie, and they all watch us. I have to chuckle … Eileen is the one who got us in to Genealogy, and now she knows all the answers the rest of us are still looking for! I hope you enjoyed todays card, I may share more with this gorgeous stamp set, but I just got my pre-order from the new catalog and I can’t wait to share some of this with you!! 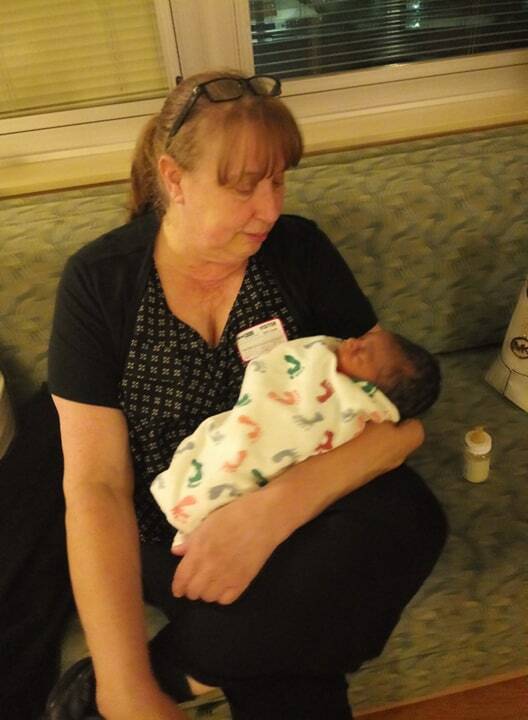 Yesterday evening while I was cutting my cardstock for my upcoming retreat, I got the phone call … My granddaughter was going to the hospital to have her baby!! So excited, it wasn’t long before then second call to say he has arrived. I even got to feed him already!! So needless to say … I did not finish my card so I’ll be back tomorrow to share it with you then. Sometimes life just happens when it’s ready! Thanks for checking back with me. Today I’d like to share with you a video showcasing the Sentimental Rose kit. The Sentimental Rose kit makes 9 cards and envelopes and includes 1 acetate box. Watch the video to get started making these distinctly beautiful cards—which are perfect for springtime stamping. Next month we have an exclusive kit designed by our Co-Founder Shelli Gardner… Order by May 10th if you’d like to join our Paper Pumpkin Party!! Options for ordering are below. Thank you for joining me today … stop back tomorrow as I will be sharing some alternative to this kit. Plus, keep an eye out for a sneak peek product!! Till then, have a wonderful day, and I’ll see you tomorrow. Hope you had a beautiful Easter! The sun is shining, and the new Everything Is Rosy Product Medley is here! I have 3 cute projects to share with you today featuring this amazing kit. For a limited time, this exclusive collection of cute, coordinating products will be available—while supplies last. Check out each item included in this petal-packed product medley. 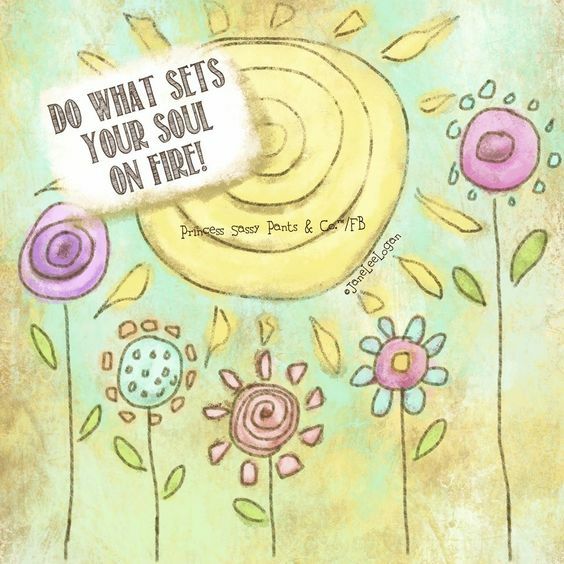 Purchase the kit through me before May 1st and I will host a special class showing you some wonderful things you can create with your new product medley. Snacks & water will also be provided to make this a fun, relaxing and creative evening. You’ll go home with 5 beautiful projects and the rest of your kit! The inspiration from our class will make you want to use up the rest of your kit!! The project you see below are not the ones you will be making in my class … so here’s even more ideas!! I love the fonts in this stamp set … so pretty. 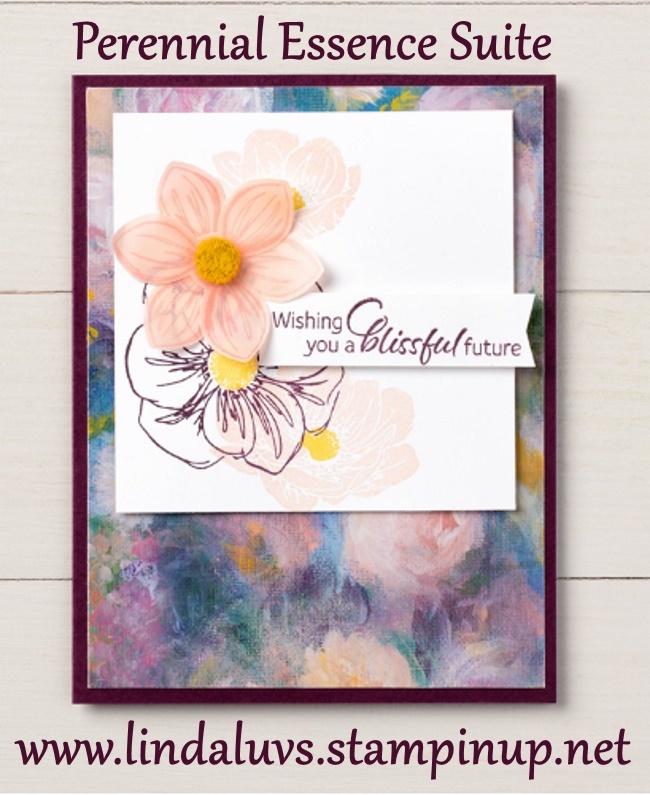 And with embellishments in the kit, you can create this card in just minutes! 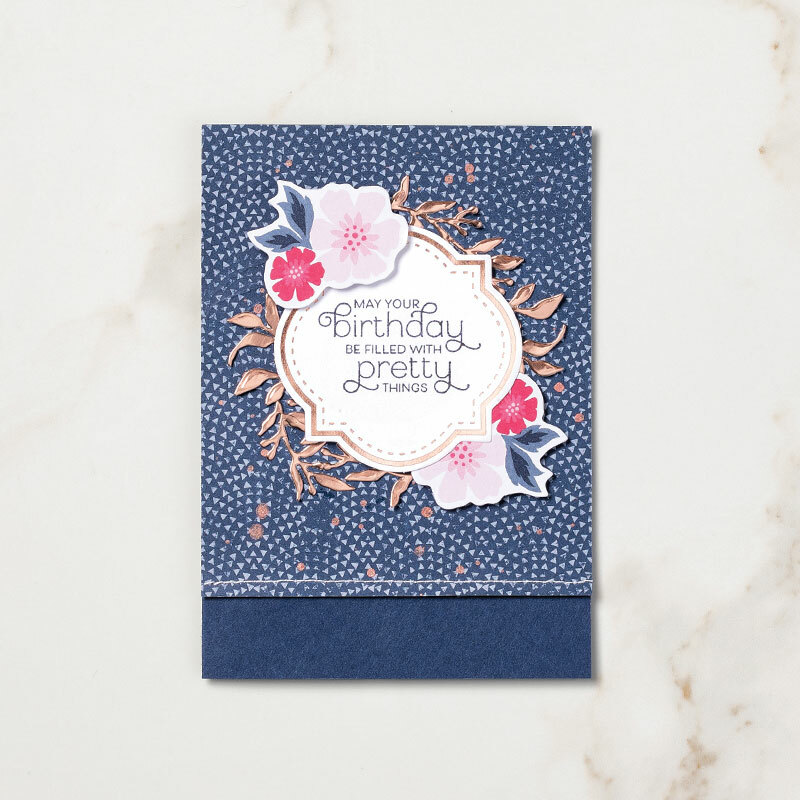 Love this card … a little stamping and some of the die cut embellishments from the kit will allow you to make many, many beautiful cards. 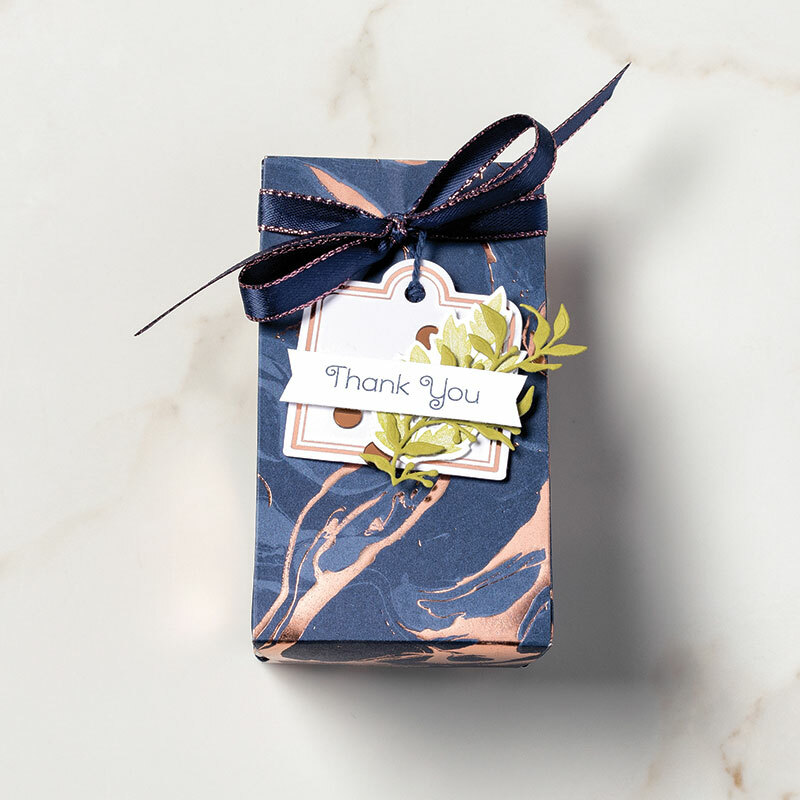 The Rose Gold veining in the designer paper is stunning and gives this little gift box a very elegant look. Thank you so much for stopping by today, have a beautiful day!! Let me know if you have any questions on this product medley. Thanks for dropping in today, I’ll be back tomorrow with my Simply Sunday series. Till then … Have a wonderful day. Today I’m going to share with you another peak into the new catalog. Oh … the new catalog! Coming to a mailbox near you, or join me at an upcoming event and pick one up, either way … they should be here in 4 – 6 weeks. 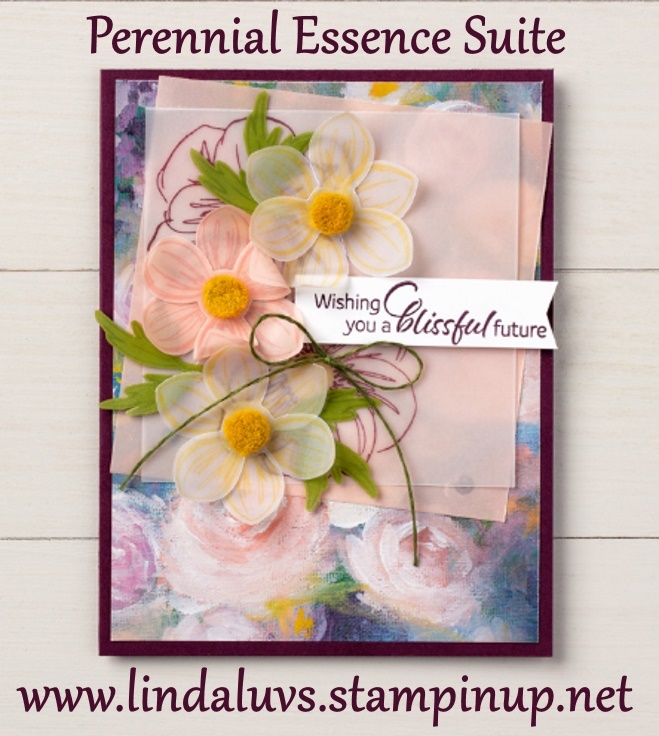 So as we turn the pages of this catalog, you will find the beautiful Perennial Essence Product Suite. Stampin’ Up! did something new this year … instead of writing in “all” the items in the suite that you felll in love with, you can now just write in a single number and get it all. Plus, the bundle numbers are still available or purchase your items separately. 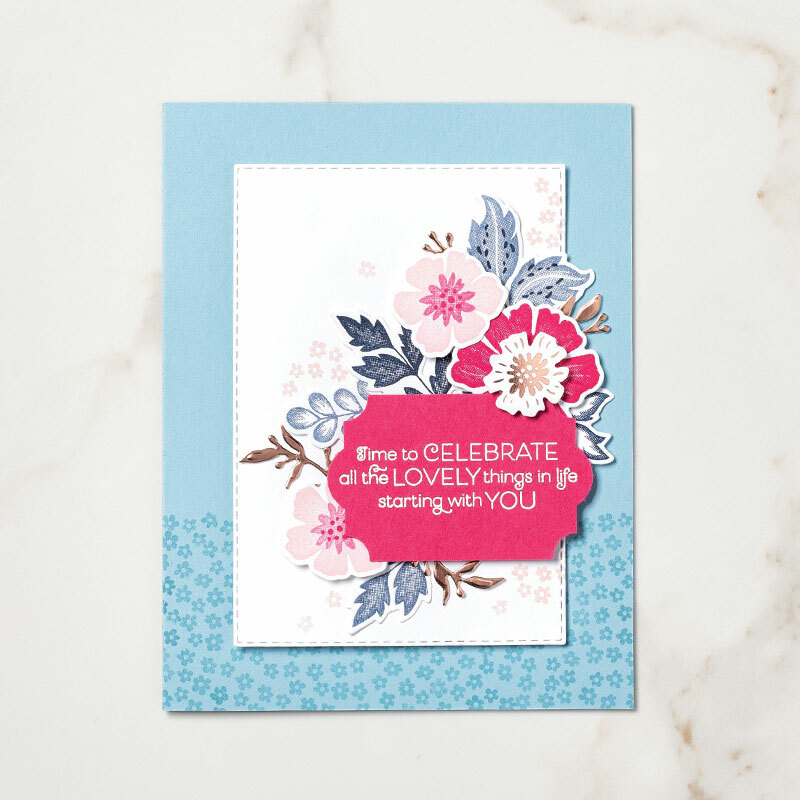 The beautiful Floral Essence stamp set is laced with pretty flowers and wonderful greetings, and coordinates with the Perennial Flower punch. I hope you also noticed the stunning designer paper; Perennial Essence with it’s Hand-painted impressionistic imagery. Our second image as the first has stamped onto the Perennial Essence Vellum cardstock and punched out to create these lovely flowers which adorn the hand stamped images on the whisper white. Here we added another flower and the bakers twine. This one (above) is the Make -n- Take that we did at our OnStage event. Now if you really want to see how you can jazz it up … just look at this! I hope you enjoyed the cards today, more for you tomorrow. Have yourself a fabulous Friday! Today I want to share with you a special product suite that was introduced to us (demonstrators) at the OnStage event I just attended, but before I do that, I want to say “Thanks” to all my stampin’ friends for your patience and support that you have shown while I was going through the loss of my sister Eileen. Now, she would be the first one to tell me it’s time to get movin’ … so I’m doing some catch up work and I’m starting with my rewards program!! I am excited to say that there are over 20 of my stampin’ friends that will be receiving a certificate for collecting 10 rewards points (some of you are very close)!! You are awesome!! We have also gained 8 new Rewards Members in the past 6 months so I’d like to welcome you to our Stampin’ Escape community! You may not know this but for each $50 you spend with me, I mark you down on my rewards sheet … and when you collect 10 points, I’ll send you a certificate to claim a FREE Stamp Set of your choice. 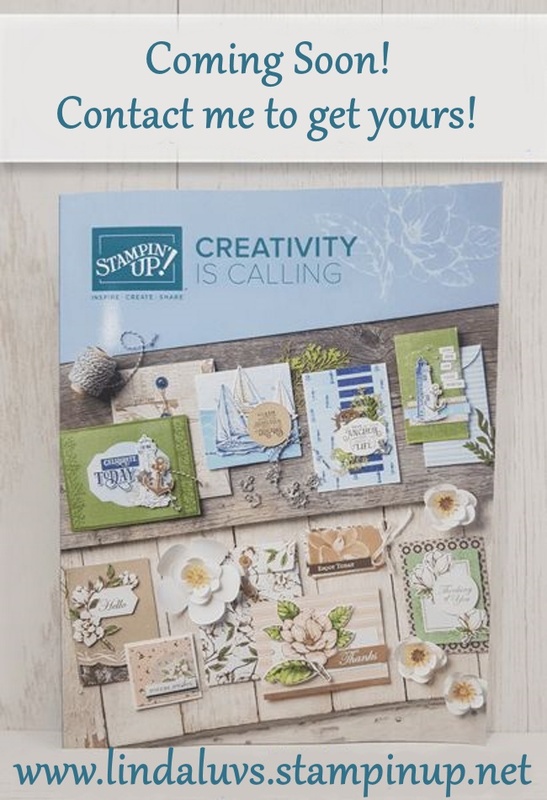 I also have a stampin’ friend in Lexington, KY … I’m already collecting points for you, and if you ever want to switch from No Contact to Customer … I’d be happy to send you the catalogs and your rewards card when filled. A BIG THANK YOU to all of you who support me and my stamping business. It is truly appreciated … I am humbled and grateful to have you as part of my community … “my tribe”… my friends. I am really excited to share this new “Product Medley” with you. It’s called the “Everything is Rosy” Product Medley. A Product Medley includes almost “everything” you need to create beautiful projects, I have a list of everything that is included below. 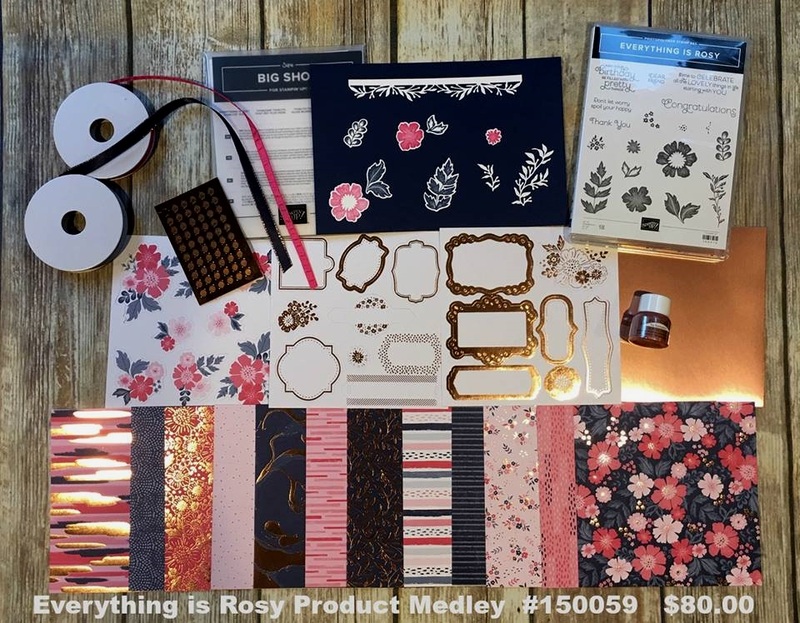 Now … we can’t order this until May 1st, but if you Pre-Order this kit with me, I am inviting you to attend a FREE “Everything is Rosy” class!! Grab a cup of coffee, sit back, relax and watch the video … and then I’ll tell you more! What do you think? Awesome right? Did you catch that in the video … 48 sheets of designer paper!! We hope you’re ready for a ray of sunshine in your life, because the Everything Is Rosy Product Medley is here! This exclusive, limited-time collection of coordinating, petal-packed products has everything you need to let your creativity bloom. Fans of “Rose Gold” are going to fall in love with this kit!! As stated in the video, is does not come with the cardstock or adhesive … but you have that. 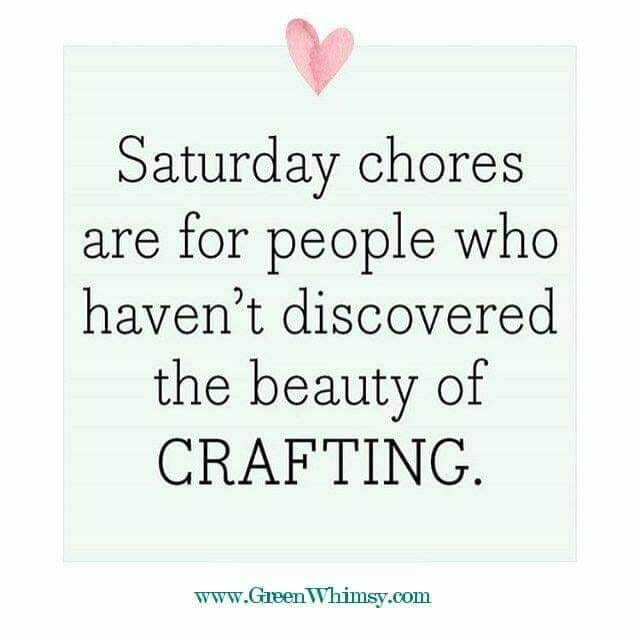 However, the reason I want to invite you over is so I can show you 5 beautiful projects you can create with you kits!! Bring your kits and your adhesive and I’ll bring the cardstock and the designs. Snacks & water will also be provided to make this a fun, relaxing and creative evening. You’ll go home with 5 beautiful projects and you’ll be able to create so much more with your kit! Join me! RSVP Today. Several recent products have far exceeded ordered quantities, and have run out quickly so this is why I’m setting up the class opportunity right away, so we can get our order in “right away” … All payments must be recieved before May 1st. You don’t want to miss out on this exclusive Product Medley, or my FREE Class. 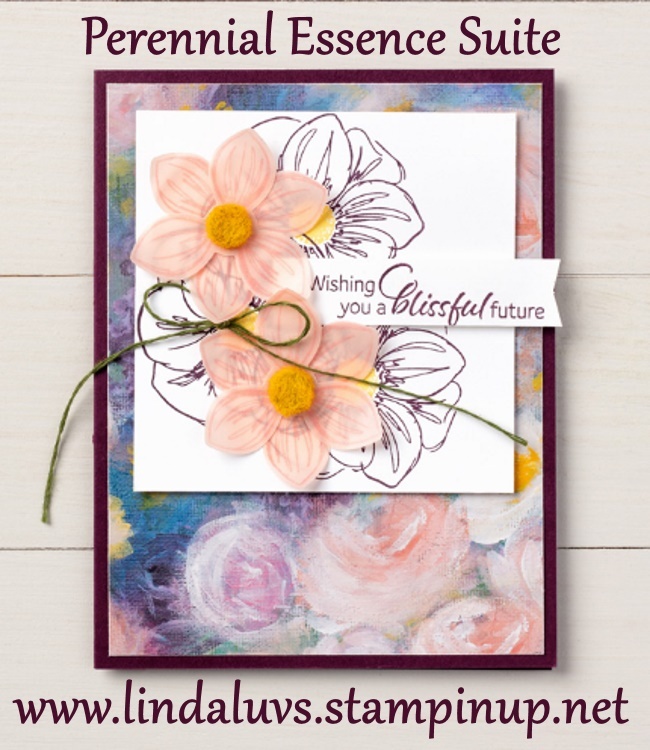 If you cannot make my class, you live too far away … order the kit from me on-line and I will send you a PDF of our cards with instructions and a little gift because you will not be able to attend. This is such an amazing product medley, I just want to share it with everyone! Thanks everyone for hanging out with me today … tomorrow I will be sharing “MORE” from our OnStage event.